Us animateurs, we don’t rely on the well-made play. We bring together a group of artists and we enter the unknown. It’s not community cultural development and it’s not (cue dreaded music) ‘group devising.’ It is deeper than that. It’s theatre making. Making theatre from scratch. We scratch below the surface and we dig deep into the dirt. This business of animateuring requires great courage and the people you bring with you on that journey must be brave and talented. Not Young Talent Time or X-Factor talented; just fearless, smart and intuitive. This thing that we do requires great courage. We open ourselves up and we push things to the edge and beyond. We risk failure, ridicule and scorn when we push too far. Most animateuring begins with a question or a hunch. An itch that just has to be scratched. We draw a big circle in the sand and we enter the play space. In that room or space we push through the shame barrier. We flail about with our bodies and minds looking for that sweet honey spot of truth; and when a brave, intuitive actor steps into this spot, our world is illuminated and we breathe a collective sigh. Why is animateuring important for us theatre mob? Because it’s the closest thing we can get to initiation and ceremony. Big call? In our ‘modern’ worlds, away from the bush and the aunties and uncles, we constantly seek that place around the fire. We yearn for stories, dance, ceremony and tradition and we seek and find these things through our craft. 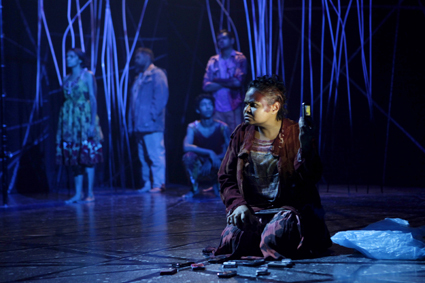 To be an animateur requires deep listening or what Stephen Page calls “listening with your eyes.” I am reminded of the making of Bloodland, a collaborative theatre performance piece co-produced by Bangarra and the Sydney Theatre Company in 2011. I have long been inspired by Stephen’s segues away from straight dance—that magic moment when a dancer speaks or when a singer or actor is allowed onto a dancer’s stage—when monologue, poetry, song and yarning are allowed to spring forth. This began for me with Bangarra’s Skin in 2000 (providing some of the most memorable moments on the blak stage, aided brilliantly by the performances of Wayne Blair and Archie Roach). So I was pleased to see Stephen step even further into the world of theatre with Bloodland (2011). Even more pleasing was the fact that the spoken word in the piece was predominately Yolngu. How gloriously annoying this was for some audience members who have become complacent, who want a plot, story, subtitles and characters to laugh at. Yet I was transfixed and reminded of Samuel Beckett’s Waiting for Godot—these two fullas who wait around as if they are on ‘sit down money,’ where words seem to have no logic, but where the atmosphere and SPIRIT is thick. Just like in Godot, the people in Bloodland had a dilemma that was presented to us in all its glory and ugliness. The audience was placed in a privileged and voyeuristic position and we left the theatre feeling unsettled. This is what makes good animateuring. The blakness. Going into the unknown. Hanging around til just after the sun sets, then coming back to camp to dance, sing or tell your story. Not to say that we all have to go up to East Arnhem Land to find that place. Some peers criticise Page for his approach, saying that this feeds the stereotype that only real blackfullas are up north. It’s wherever we find our inspiration; each of us has our own traditions, country, stories, totems to draw upon and that’s what keeps the blak theatre fires burning. 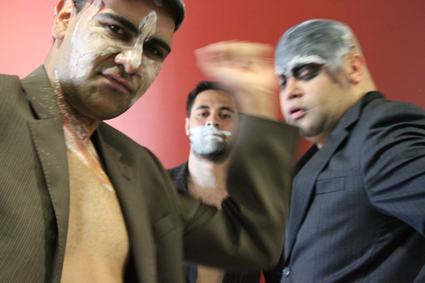 I recently experienced theatre as ‘contemporary initiation’ when I collaborated on Bully Beef Stew (RT105) at PACT Centre for Emerging Artists with Sonny Dallas Law, Colin Kinchela and Bjorn Stewart as they walked valiantly into that ‘dark place.’ As animateur it was my job to provide a creative framework for these wonderfully talented artists to explore Aboriginal male experiences and notions of initiation. As an Aboriginal woman I was required to leave the room many times and I will never know what happened behind that door. All I know is that when I came back to see them perform, they had changed. I love it when theatre can do that. When the indescribably sacred is felt but not known. Andrea James	What about ‘throw dirt on actor’?????? Bjorn Stewart	Damn it! See now all you blackfellas are trying to steal my idea! For us animateurs, concepts of ceremony, tradition, initiation and clan systems are hard to uphold in an industry that is essentially market driven and predominately controlled by non-Aboriginal artistic directors and bureaucrats obsessed with bums on seats. Limited funding and therefore limited time often forces us to reduce our cultural ambitions. Going onto country to make work is a per diem minefield that needs to be battled. Waiting for country to speak to us doesn’t always fit neatly into a project budget. Furthermore, the idea of ‘profit,’ as Bjorn so succinctly puts it, flies in the face of more traditional notions of reciprocity. With our practice comes a sense of cultural responsibility and the unspoken expectation of reciprocity that some non-Aboriginal artists can avoid. Us blackfulla artists avoid this at our peril. Our work is about much much more than mooms on seats. There’s a blak commerce at play too. “None of that is contracted legally,” says Page. “It’s all based on bartering and giving back and going up there and doing shows, workshopping with the kids… That has a lot to do with this organic process….here’s this full circle of giving back from where inspiration is.” This is the gift that Aboriginal artists give back to their communities in recognition and appreciation of our inherited stories and traditions. Which is why we must keep scratching, keep digging and telling our stories our way.